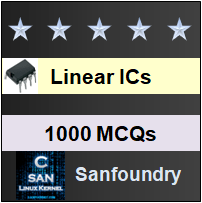 This set of Linear Integrated Circuit Multiple Choice Questions & Answers (MCQs) focuses on “Basic Principles of Phase-Locked Loops “. Explanation: Free running multivibrator operates at a frequency which is determined by an external tuning capacitor and a resistor. On applying a dc control voltage the frequency can be shifted on either sides. This frequency deviation is directly proportional to the dc control voltage and hence it is called as ‘voltage controlled oscillator’. Explanation: The phase detector compares the input frequency with the feedback frequency and produces output dc voltage called as error voltage. 3. At which state the phase-locked loop tracks any change in input frequency? Explanation: In the phase-locked, the output frequency is exactly same as the input signal frequency. So the circuit tracks any change in the input frequency through its repetitive action. Explanation: Before the input is applied, the PLL is in a free running state. Once the input frequency is applied, the VCO frequency start to change & PLL is said to be in capture mode. When the VCO frequency continues to change until it is equal to the input frequency, the PLL is said to be in phase locked state. 5. What is the function of low pass filter in phase-locked loop? Explanation: The output voltage of a phase detector is a dc voltage and is often referred to as error voltage. This output is applied to the low pass filter which removes the high frequency noise and produces a dc level. 6. What is the need to generate corrective control voltage? Explanation: The output frequency(fo) of VCO is identical to input frequency(fs) except for a finite phase difference(φ), which generates a corrective control voltage to shift VCO frequency from fo to fs, thereby maintains the lock once locked and PLL tracks the frequency changes of the input signal. 7. At what range the PLL can maintain the lock in the circuit? Explanation: The change in frequency of the incoming signal can be tracked when the PLL is locked. So, the range of frequencies over which PLL maintains the lock with the incoming signal is called as the lock in range. Explanation: The pull-in time depends on the above mentioned characteristics to establish lock in the PLL circuit.